This command modifies the interface cost used in calculating the root port for spanning-tree on a switch. Lower is better. 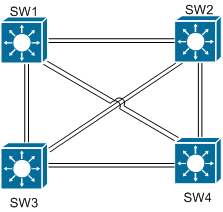 In the below example we will configure SW2 to use Fa0/24 as the root port for all VLANs. Next we configure Fa0/24 for vlan 10 to have a cost of 1.